Abundant sunshine. High around 75F. Winds SSW at 10 to 15 mph..
Clear to partly cloudy. Low 51F. Winds S at 10 to 15 mph. It all started with the weirdest discovery. 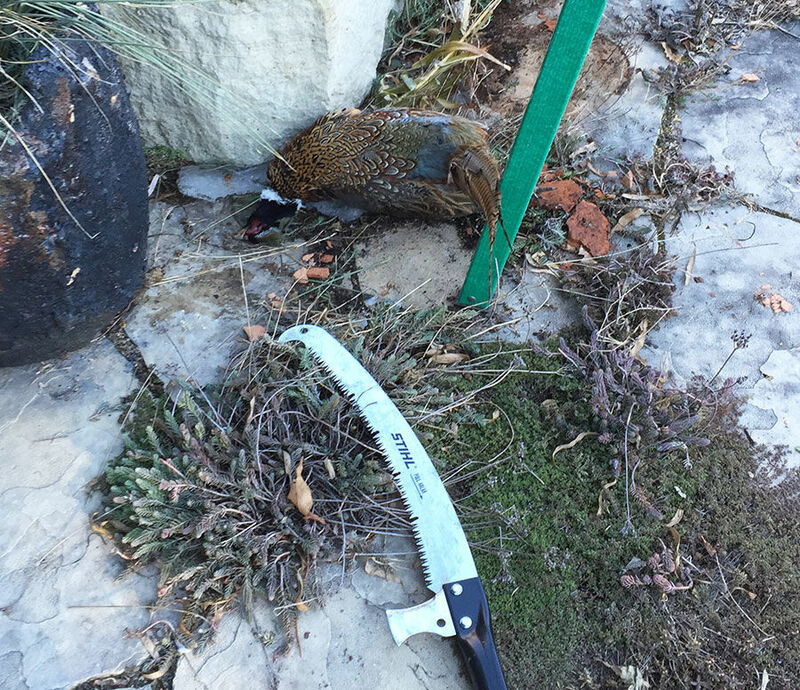 Twenty feet above the patio, a pheasant’s head rested on the edge of the round gutter. It all started with the weirdest discovery. My friend and I were walking to my back door last month, and I glanced up. 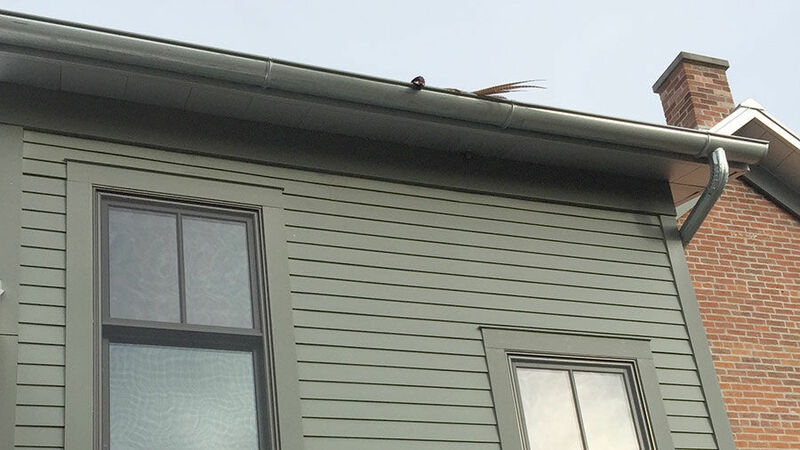 Twenty feet above the patio, a pheasant’s head rested on the edge of the round gutter. His long tail feathers were spires in the air. And that was all we could see. “Think it’s dead?” she said. I’ve often had owls and sometimes raccoons on the roof, and my sister once had a live peacock they named Kevin show up on hers, but this was a new predicament. How’d he end up there? Has he been there long? Is he gooey or frozen, stuck to the gutter? This required some pondering, but not too much inaction: The next day would be sunny, but rain was in the forecast. The longer I waited, the bigger the problem. Whenever there’s something out of reach you have to get, you better be thinking safety thoughts. The obvious solution was call someone, pass the problem off to a gutter cleaning company! Critter controllers! But I was feeling tight and a little stubborn, so the next morning I eyeballed the situation again and reconnoitered my garage and barn for inspiration. Nothing. The extension ladder puts me under the bird — can’t reach backwards over the eaves. The tall step ladder won’t get me within striking distance, even with a rake. My family farms on the other side of the state, but I still tap into them regarding “predicaments.” We share the tight and stubborn genes and get a little charged up for tackling weird problems. I texted my brother some pictures. Doug’s one of the most creative guys I know; he can build anything, fixes things better than they were built, and in a pinch can jury rig almost anything with a milk jug, pliers, chain and stuff out of the junk pile. Plan B! I brought in two dirty hoes, took the screen off the upper stairwell window and stuck my head out. He seemed so close. And the stone patio seemed so far, sure to crack me like Humpty Dumptress if I fell. But(t!) my ample caboose gives me a low center of gravity, as long I keep that inside the window, I probably won’t fall out. So I put my safety glasses on to protect my eyes from falling feathers and blood, and gave a careful reach. The angle wasn’t right. Holding on to the hoe-end with both hands was tricky — its business end was heavy and hard to control overhead. Worst-case scenarios were coming to mind. If I lose my grip, this hoe will cleave my head. Maybe break a window. If I dodge it, I could go out the window. Are neighbors watching? How long before someone would find me? My family would have to come down here and plan my funeral. I don’t think they’d know what I want. They would have to sort all my stuff and get rid of it. Do other people think about this stuff when they decide if they’ll go ahead and take a risk? That their family will be dealing with the outcome? I was both inside this safety story and observing it at the same time. My hoe and too-short self weren’t enough to hook the bird, but I did release a bunch of feathers and inadvertently nudge his head back into the gutter. Oops. I reported back to Doug. Plan C! My vet didn’t have a crook, but they loaned me an odd rod they used for other purposes. It was too short. The closest farm store only had a short crook for catching goats. And my super resourceful neighbor — my friend, and I call him Larry the Hero — wasn’t at his shop. The clerk asked what I was looking for. In the plumbing and garden areas, we mulled inventions to cobble from sickles, swing weeders, claws and pipe. I left with $4 of worm gear clamps for sistering a second handle on my hoe. The angle might not be right, but the price was. My ideal tool was something expandable, articulating, light weight, with a hook or grabber. And then I spotted it — Plan E — back in a corner of the garage. My telescoping tree saw! Its end hook, snaggy blade and sturdy aluminum handle might be the ticket. I sent a picture of it and my ladder to Doug. “Ah yes,” came the reply, then his “safety lady” headline for failed Plan E, seconds later. By the end of the afternoon, I had the big step ladder on the patio and was balancing the saw, keeping myself centered between the rails and leaning into the ladder. Extending it a little bit at a time, checking what that did to my balance, a couple steps up the ladder. The reach was right, the hook was perfect, and after several tries, I flipped birdie out with a satisfying (but sad) plunk to the patio. How he got there remains a mystery; he hadn’t been shot or wounded. He was perfect, almost. For thinking safety in all sorts of problem-solving predicaments, routine to bizarre. For imagining those worst-case outcomes, no matter how unlikely, and who’d have to deal with the consequences. For staying in touch with somebody when you’re working alone doing something risky. For talking over the plans before you put them in motion. And reassessing until you find the safe solution, not just the first solution. Even when the predicament at first seems as ridiculous as it is problematic. I hope you’ll be thinking safety, too, through this New Year. Your loved ones would appreciate it. Stephanie Leonard is an occupational safety manager at the University of Iowa. Contact her at stephanie-leonard@uiowa.edu.